My name is Sasha and I live in Park Slope, Brooklyn. I have lived in New York City (Manhattan and Brooklyn) for about nine years, since graduating from Haverford College. 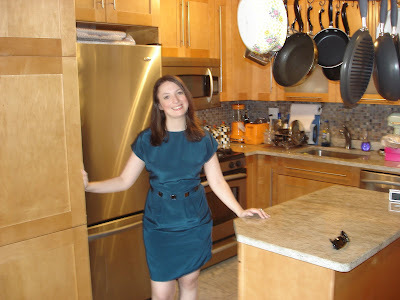 I started A Kitchen In Brooklyn in November, 2009 for fun, as a hobby, so that I could combine my passions -- cooking and writing. I'm also an attorney, specializing in intellectual property law professionally, and a passionate writer. My other interests include modern art, painting, ceramics, spending time with my husband, Brad and family, animals and dogs (especially pugs), travel, hiking, politics and sports. A Kitchen In Brooklyn is a food website of recipes and other food-related content with 16 guest or contributing writers. We have a growing community of readers in only a couple months. If you like what you see, please become a fan of A Kitchen In Brooklyn on Facebook or follow us on Twitter. We'd love for you to follow us each day for updates on our newest recipes! In addition to me, some of my culinary inclined friends will sometimes share a post here and there. I also hope to share my favorite culinary-related experiences from restaurants to travel. The focus here is not only on showcasing beautiful food creations, like many food blogs, but also on interesting anecdotes and stories about food, a portal into our lives and why I cook, and on making my recipes accessible to our readers so that I truly can share my kitchen with yours. I hope that you will find recipes here that you can share with your own families - wherever you live. Please feel free to contact me at scoffiner@akitcheninbrooklyn.com.